We’d love your help. Let us know what’s wrong with this preview of How to Raise an Adult by Julie Lythcott-Haims. To ask other readers questions about How to Raise an Adult, please sign up. Does this book apply to you? And if so, what are your reasons and how do you use them? 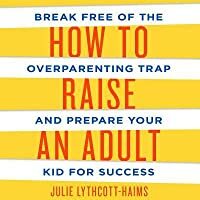 (4.0) Takes a while to get useful (if you need convincing that overparenting is A Thing, you probably need a lot more than this book), but has many concrete suggestions to better prepare your children for adulthood. Many of these start at toddlerhood or early elementary school, so get started as soon as you have a child! Started off with 4.5, but remembered how long it took to get out of the anecdotal whining at the beginning. 1. 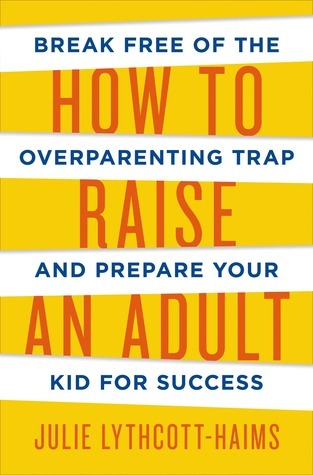 Most of overparenting comes from fear (of abduction, of fall (4.0) Takes a while to get useful (if you need convincing that overparenting is A Thing, you probably need a lot more than this book), but has many concrete suggestions to better prepare your children for adulthood. Many of these start at toddlerhood or early elementary school, so get started as soon as you have a child! - help them choose school best for them, not necessarily The Best. - elementary: ask them "why" questions: why do you belief that, how do you know, can you think of other reasons/possibilities? - high: what did you enjoy? why? what do you think makes that interesting to you? * let them / force them to speak up for themselves with strangers/authority. let them know ahead of time you'll be looking to them to do all the talking and you'll be able to provide any missing info if they need it. * look at schools other than "the top"
- lacking basic life skills (feed, clothe, launder, get out of bed in time) -- "learned helplessness"
* parents stressed out too! * claims that admissions process is "broken", but not sure what she means (reliance on SATs, US News). Which colleges are letting in people that they should not? - also: stopping overparenting doesn't 'fix' this problem at all, unless she actually means that parents are too focused on "top" schools and if they eased up things would be better? * hardcover p. 19: "libeties" => "liberties"
It is as if Julie Lythcott-Haims was eves-dropping on every teacher's room in America. This overparenting epidemic has broken down a student's will to persevere and take ownership of his or her own work. As a teacher for the last ten years, I have seen a steady increase in over-involvement which has left me shaking my head and even seriously considering leaving the field. I became an educator to help kids realize their dreams and become more literate citizens so as to have their voices heard as It is as if Julie Lythcott-Haims was eves-dropping on every teacher's room in America. This overparenting epidemic has broken down a student's will to persevere and take ownership of his or her own work. As a teacher for the last ten years, I have seen a steady increase in over-involvement which has left me shaking my head and even seriously considering leaving the field. I became an educator to help kids realize their dreams and become more literate citizens so as to have their voices heard as truly effective communicators. This can't happen if the voice heard is not even their own. As a new parent, I found it reasuring to hear that the research supports a different approach. I, too, want the best for my child, but not at the expense of his own freedom of thought and will. I want him to strive for success in the same way I did: on his own. It is very encouraging to hear that the research has been done and is there for anyone to see. Children don't need their parents to step in; they need them to step BACK. I gave this two stars. I think it may deserve more, but that it was written for a different demographic than me. The beginning and the end were over the top. The author tells the reader not to worry so much about your kid getting into elite schools, there are lots of choices out there. Then, throughout the book, she mentions Barnard, Rice and Carleton as some of the alternatives!!!! I can only imagine what parents who think of these schools as alternatives would think if their kid wants to go to I gave this two stars. I think it may deserve more, but that it was written for a different demographic than me. The beginning and the end were over the top. The author tells the reader not to worry so much about your kid getting into elite schools, there are lots of choices out there. Then, throughout the book, she mentions Barnard, Rice and Carleton as some of the alternatives!!!! I can only imagine what parents who think of these schools as alternatives would think if their kid wants to go to cosmetology school. She also talks a lot about kids being coddled, but uses some mixed examples. Yes, a kid who can't figure out how to get a crate up to his dorm room or a parent who answers all the questions aimed at the kid during a session with a college advisor has probably been over-parented. But then she throws in examples like the 20 year old who asks his parents to help him look for an apartment. Everyone should have a buddy when looking for housing, especially a first-time renter, so they are not taken advantage of. If you have a parent willing to take on that role, so much the better. I thought the best part of this book was section 3 where the author gives concrete practical advice on steps you can take at your child's various ages to teach them independence skills. The rest of it seemed to be written for her peers in places like Palo Alto, not for the every day parent in middle of the road towns and cities throughout America. As is pretty obvious by the fact that she holds Teach for America up as a paragon of virtue. If she lived in a city with struggling schools, she would know that TFA has been under attack for many things, including a way to bust teachers unions, a revolving door of inexperienced teachers for our country's neediest students, and as mostly a way for elites to pad their resume. I was comforted by the fact that, despite my neurosis, we don't make enough money to completely ruin our children. Many of the examples were geared toward parents with virtually endless resources, but the book did give a more complete look at what our job as parents is and is not. The book also helped quell the idea that a successful life cannot be had outside of an Ivy League education. Overall, a good read for parents who need a chill pill. I thought this book had sound advice and was well-written. So why am I only giving it three stars? Because most of what the author said was in the "Well, duh" category (e.g., don't write your kids' college essays for them). The book also had a lot of redundancy; the main points could have been sufficiently described in a long article rather than in an entire book. I live in the same place and the same time as the author (Silicon Valley in the mid-2010s), and I'm also a parent of young children, s I thought this book had sound advice and was well-written. So why am I only giving it three stars? Because most of what the author said was in the "Well, duh" category (e.g., don't write your kids' college essays for them). The book also had a lot of redundancy; the main points could have been sufficiently described in a long article rather than in an entire book. I live in the same place and the same time as the author (Silicon Valley in the mid-2010s), and I'm also a parent of young children, so I'm sure I'll meet parents who do the things that Lythcott-Haims describes: sign their kids up for "prestigious" nursery schools in their first week of life; do all their kids' chores for them; overschedule their kids with music lessons and organized sports and tutoring so that they no longer have time to play; micromanage every aspect of the college application process; and even accompany them to job interviews! However, this behavior is all patently ridiculous to me. With me as a reader, Lythcott-Haims is preaching to the converted. You can bet that MY kids are gonna wash the dishes, fold their own laundry, and do their own homework. And I'd much rather see them go to a state school and feel fulfilled and at-home, rather than make it to the Ivy League and be stressed and miserable. I have to wonder if the worst perpetrators of "helicopter parenting" would even pick up this book, and if so, whether it would change their views? Another thing that made the book less appealing to me is the fact that Lythcott-Haims relies mostly on anecdotes and pithy quotes rather than concrete data on what influences kids' ultimate success and satisfaction in life. Granted, good data on this topic are hard to come by, but I got a bit weary of the author making her points with quotes from other popular authors rather than with evidence. 1. My grandmother used to pack her children lunch and send them out the door to play in a wooded area a mile or so from their home—for the day. They were young, they had no cell phones, they were gone for upwards of six hours playing by a river. And it was okay—not just with my grandma and the kids, but with the neighbors too. My mom and aunts and uncles spent a good portion of their summer vacation unsupervised. Today parents could lose custody of their kids for the same behavior. 2. When other kids are over at my house for a playdate, I don’t watch them constantly. But I like to have a door open, I like to hear the sounds of their play drifting down the hall. Sometimes I drop in and orchestrate things—a playdough party or whatnot. And here’s my confession, when the other parent comes to pick up their kid if they happen to come in when I’m directly involved in the play, I feel proud. Gold star for me. If they happen to come in when I’m letting the kids play unsupervised and I’m reading my own book or doing something for myself, I feel a bit deficient. My first impulse is to say, “Just a half hour ago I was playing with them…” Not only would I not let my kids spend 6 hours unsupervised by a river a mile from our house, but I feel the need to be aware of what they are doing when they are playing inside our house. Much of the material about the intensity and desperation parents feel for their kids to get into Ivy League schools was foreign to me. It is an interesting and dysfunctional system—the quote “the elite have purchased self-perpetuation at the price of their children’s unhappiness” seemed to be on target, and she had several thought-provoking quotes from Deresiewicz (author of Excellent Sheep). *Don’t do things for your kids that they can do for themselves, or can almost do from themselves. *Kids need to do chores (and there’s decent evidence that homework has no proven benefit (p179). Ha! The more homework my kids get the more I resent the time it requires and how it eats into our family schedule (and their opportunity to do the dishes, vacuum, et cetera)). *Free play is incredibly important. I know why that mom was standing there. The invisible “they”—my perception of the collective cultural voice—tells me that I’m a good mother if I observe every detail of my children’s lives and attend every sporting event, recital, and school performance. (And I’m supposed to have them all—sports, music, academics, and extras. The checklisted childhood is packed with too many activities for a healthy/sane family to handle). “They” tell me that I’m deficient in my parental role if I don’t attend every soccer game. I don’t always listen to “them” in how I parent, and this book was a nice reminder that when our collective culture tells us to “helicopter parent” our kids, they’re wrong. And the alternatives to helicopter parenting are both healthier and easier. This book helps me realize that the struggle to raise a responsible adult is not unique to any society. It's happening all over the world. Reading this book, I had that exhilarating feeling that many problems facing upper middle class families in the US can be found in Vietnam: overprotecting parents, college pressure, competition and self-effacement during parenthood. However, the people she interviewed, the situations she described kept me thinking that I was reading about first world problems This book helps me realize that the struggle to raise a responsible adult is not unique to any society. It's happening all over the world. Reading this book, I had that exhilarating feeling that many problems facing upper middle class families in the US can be found in Vietnam: overprotecting parents, college pressure, competition and self-effacement during parenthood. I picked up this book looking for validation of my parenting methods and I got it. Earlier this year I read "Overwhelmed" because of my growing sense of unease with my life and how overwhelmed with the task of raising my children I was. After reading that book I said I was subscribing to what I called "retro parenting." That is, I was going to raise my kids the way I was raised by my parents. My parents loved me and helped me and supported me, but they largely left me to my own devices and I man I picked up this book looking for validation of my parenting methods and I got it. Earlier this year I read "Overwhelmed" because of my growing sense of unease with my life and how overwhelmed with the task of raising my children I was. After reading that book I said I was subscribing to what I called "retro parenting." That is, I was going to raise my kids the way I was raised by my parents. My parents loved me and helped me and supported me, but they largely left me to my own devices and I managed schooling and life just fine. My parents really didn't care what we did with our lives as long as we did something. As a modern parent I have totally applied all of my education and professional skills to the task of raising my children. Some of that approach has benefited them greatly, but a lot of it has not. In the last few years (as we have had more kids especially) I have started to expect more of our children and I am glad that I have. We have always said that we want to raise self-sufficient, fully-functioning adults who can contribute to society. We have not always done a good job in showing them how to get there and I do not feel like our schools are especially helpful on that front either. We have made some big changes in recent years and will continue to do so. This book has encouraged me to step back even more and it feels great! We have five children and the older two (12 and 10) and do a lot of chores - including their own laundry, cleaning up after dinner, looking after the dog, tidying the house, and maintaining their rooms. We have just added making their own lunches and cooking dinner once a week. Compared to their peers my kids do a lot of chores. After reading this book I can see I need to make them do even more and I need to back way off on the school front. We need to teach our kids self-efficacy. And one of the ways we do this is letting them fail. When we bail them out, do for them, or generally clear the path or make it easier we are denying our kids valuable learning opportunities. It was not until I read this book did I realize just how much of this I do and I think I have come a long way! Things as simple as taking them their forgotten lunch or gym uniform - how will they learn if I fix it for them? Giving our kids the chance to fail also teaches them resilience and grit. We deny this to them when we do for them. As a naturalized American born and raised in Australia the American tertiary education system is absolutely daunting to me. Comparatively speaking there are only a handful of universities in Australia. I knew there were a lot in the United States, but reading that there were 2800 colleges was news to me! Good news! This book gave me great faith that there is a college out there for my kids that will be a great fit for them. It may be a college that I have never heard of, but it will probably give then a good education. We had already decided as a family that we were not going to buy into the college race/checklist thought process. The idea of voluntourism and sports for a college application just made us squirm. We had already decided to opt out of all of that, both for the sanity of our child and for the happiness of our family and this book gives permission to do that. This book was also a really good reminder that our kids should be learning for the sake of learning, not for the grades and not to get into college. All of our kids have gone to or currently attend Montessori schools. We love Montessori for the love of learning that it instills in children. Our two big kids left Montessori for public school in first grade and their love of learning has diminished ever since. We live in a great school district that offers a very rigorous education, but the emphasis is on an advanced classes and grades and achieving for the sake of achievement. We have found a great high school that will foster a love of learning and we are excited to send our kids there, but we need to get through middle school first. My big kids are both in the gifted programs for their grades, but it is not really directed at kids who think and approach things differently - it is just more, sooner, faster, harder and I am not sure what the point is. My oldest is not enjoying and is struggling in his advanced math class. After reading this book we are more than okay if he decides he wants to drop down to the regular math class. Moreover, we want that to be his decision. When we were kids our parents talked to our teachers maybe once or twice a year and I want that for my kids too. I want to hand over responsibility for my kid's education to them - we can't do it for them after all - and again this book encourages that. Most of all this book gives parents permission to have a life! I am so grateful for that. This books has been great for giving me permission to do what I already want to do - give my kids autonomy, responsibility and life skills. Plus it encourages me to have a life! It's a great example for my kids. It's incredibly liberating to take the time for the things that matter to me and also to have the confidence in my kids that they can do the right things with the tools we give them. I really appreciated the list of resources that Julie gives towards the end of the book. I followed a bunch of her recommendations on Facebook and seeing the encouraging posts in my feed remind me that I am doing the right thing when a lot of folks in my community are still doing homework for their kids and picking up after them. My husband and I have five kids and we both work in education. I wish there was a road map that we and other parents can follow to raise kids to become successful adults. This book provides some unique insight into helping children to become successful. Every parent should read this - rich parents, poor parents, controlling parents, free range parents - all of them. I feel like we have become a generation of parents who want this bubble of protection around our kids yet we want them to grow up t My husband and I have five kids and we both work in education. I wish there was a road map that we and other parents can follow to raise kids to become successful adults. This book provides some unique insight into helping children to become successful. Every parent should read this - rich parents, poor parents, controlling parents, free range parents - all of them. I feel like we have become a generation of parents who want this bubble of protection around our kids yet we want them to grow up to be responsible and successful adults. Those don't necessarily go hand in hand. Reading this book is the first step to guide you through the process. Really informative and eye-opening book. I recommend watching her TED talk if you are short on time--though I'll admit that I loved reading all the stories about the crazy helicopter parents she's encountered as a student dean at Stanford. Yowza. This book was SHOCKING and horrifying and really sad and gross in a lot places. It's all about the kids growing up with "helicopter parents" who are growing into adults who have had no adversity, have no life skills and cannot do anything for themselves. The stories that were told in this book were extreme, but they sure opened my eyes and made me think "I do NOT want to do this!" I mean a 20-something who has her first review at work and it isn't great so her MOM calls the HR department to complain?! The kids who are at college and their parents GO TO COLLEGE every weekend to do their laundry?! It's about how somewhere parenting changed from preparing kids for life to protecting them from everything. These kids don't have street smarts, don't know how to do basic things...it is so sad. The author calls it "invasive parenting" that is growing a "nation of wimps." Kids need to make mistakes, then need to learn from them and "they also need to be prepared for when things go wrong." "Millenials have been called the 'Everyone Gets a Trophy' generation for good reason." "Moms seem so overinvolved in solving problems for their children instead of letting the kids learn to work it out." The book is written by the Dean of Standford admissions. Sometimes it was a little heavy on the college-prep aspect, which didn't interest me as much, but the book was well-written, well-researched and easy to read. And boy was it eye-opening. I've seen it with friends who have kids--their kids are so overscheduled the parents are frazzled, have no time, the kids have no down time and it certainly doesn't sound like something I want for our little family. Somewhere parents have stopped allowing free play and expression of creativity, or allowing their kids to struggle and figure things out. Play is narrated (something I also read about in the book "Bringing Up Bebe"), parents step in if there's any disagreement between kids on the playground. The kids aren't taught to solve their own problems. "They grasp for control in every way, and don't allow their children to figure it out." "Having things done for you and having no control over those outcomes can also lead to a kind of 'learned helplessness." Instead we should be teaching "self-effacy, which is the belief in your abilities to complete a task, reach a goal, and manage a situation." The book does give ideas on how to fix/avoid the trap of over-parenting and teaching kids, even little kids, how to be self-sufficient, questioning and problem-solving. I loved the examples (broken down by age groups) on little things you can do to grow their self-effacy, self-esteem and teach them life skills. Author Lythcott-Haines was a Dean at Stanford, then became totally frustrated with helicopter parents. The students they raised were fragile, delicate flowers who could get A's, but couldn't function in the real world. She advocates allowing your child to fail, for they will then learn new skills. Kids need time to be bored, to go away from home, to do chores, and to try activities that won't further their resumes. 1. Ta Author Lythcott-Haines was a Dean at Stanford, then became totally frustrated with helicopter parents. The students they raised were fragile, delicate flowers who could get A's, but couldn't function in the real world. She advocates allowing your child to fail, for they will then learn new skills. Kids need time to be bored, to go away from home, to do chores, and to try activities that won't further their resumes. 2. Find his way around campus or the city in which he lives. 3. Manage his assignments and deadlines. 5. Earn and manage money. This book is right on target. I see this problem everywhere. The problem is that this book could have been written in less than half the space. Very repetitive and goes way to far in making each point. I could not read it all but ended up scanning through it. no matter where you are in your parenting journey this is an excellent reminder about the dangers of modern motherhood....and fatherhood too. doing more is not necessarily better for our growing and developing adults. This book was just the book I needed right now - parenting is the hardest thing I have ever done, and this book validated some of the choices we have made while giving me a lot to think as B navigates 8th grade in preparation for HS. My biggest take away: Parents must step back and let children make the "little" mistakes necessary to learn responsibility; the "little" mistakes teach the things necessary to be successful and independent! All in all this is a decent book with a worthwhile message, but I got the feeling I (despite being a parent) was not the target audience for this book, who I gather consist of upper-middle class soccer parents and tiger mom control freaks who dictate what/when their children should study, eat, and/or breathe. However, I don't see those types of parents gravitating to this book to begin with, although the author makes the prescient point that while writing this book she learned she WAS unwittingl All in all this is a decent book with a worthwhile message, but I got the feeling I (despite being a parent) was not the target audience for this book, who I gather consist of upper-middle class soccer parents and tiger mom control freaks who dictate what/when their children should study, eat, and/or breathe. However, I don't see those types of parents gravitating to this book to begin with, although the author makes the prescient point that while writing this book she learned she WAS unwittingly turning into one of those. So fast forward a few years and maybe I'll be there. Naw. This is a book aimed at people who can't abide "unstructured" time and who will emotionally implode if their dear progeny do NOT get a law degree from Harvard. I think I'm safe. It probably helps that I don't live in Palo Alto or NYC so I really don't recognize the insanely competitive schooling environment that the author laments throughout the book. May I remain so lucky. A worthy addition to the ever-burgeoning Stop Helicoptering Your Children Canon. It's a quick read and at once philosophical and practical. It is especially relevant to any parent who has not yet begun the college admissions process, as she has excellent, very specific statistics and advice about exactly how and why you should just calm the eff down and not at all worry about your kid getting into Stanford. Small points of criticism: as a former Stanford dean and current resident of Palo Alto, sh A worthy addition to the ever-burgeoning Stop Helicoptering Your Children Canon. It's a quick read and at once philosophical and practical. It is especially relevant to any parent who has not yet begun the college admissions process, as she has excellent, very specific statistics and advice about exactly how and why you should just calm the eff down and not at all worry about your kid getting into Stanford. Small points of criticism: as a former Stanford dean and current resident of Palo Alto, she must say the word "Stanford" a thousand times in this book. She uses admission into Stanford as a stand-in for any of the very tip-top prestigious schools and as the holy grail of helicopter parents in countless examples. On the one hand, I get that she was mining her own experience, but on the other hand, I think all the Stanford Stanford Stanford could possibly bolster its repuation as being the Ur-University. It made me wonder if she got a kick-back from Stanford. Why not occasionally use Harvard? Or Duke? Or Yale? This book made me feel very thankful for the choices my parents made in raising me and my sister, even if many of those choices were born out of necessity -- as my dad was often fond of saying, we were poor, but we were happy. Perhaps because of this rather modest upbringing, I was never held to some near-impossible standard, and I wasn't expected to enter some holy grail of a particular college or vocation. Instead, there was a trust placed in me from a young age, a willingness to allow me to f This book made me feel very thankful for the choices my parents made in raising me and my sister, even if many of those choices were born out of necessity -- as my dad was often fond of saying, we were poor, but we were happy. Perhaps because of this rather modest upbringing, I was never held to some near-impossible standard, and I wasn't expected to enter some holy grail of a particular college or vocation. Instead, there was a trust placed in me from a young age, a willingness to allow me to figure out my own path, which I'm only learning to really appreciate now as I get older. Julie Lythocott-Haims produced a fantastic podcast that I listened to last year called "Getting In" talking about the process of college applications and selection. I loved it and appreciated her attitude and perspective. She's a previous freshman dean from Stanford as well as a mother to a son and daughter. Her book is just as enlightening as her podcast. She gives many examples of overparenting of which I am guilty. As my kids age, I continue to learn as they continue to change and grow. I lea Julie Lythocott-Haims produced a fantastic podcast that I listened to last year called "Getting In" talking about the process of college applications and selection. I loved it and appreciated her attitude and perspective. She's a previous freshman dean from Stanford as well as a mother to a son and daughter. Her book is just as enlightening as her podcast. She gives many examples of overparenting of which I am guilty. As my kids age, I continue to learn as they continue to change and grow. I learned a lot from the author and plan to implement changes in my parenting. Read this for book club. It’s super work relevant. Everyone: read it. I received an advanced reader's copy of this book through Goodreads Giveaways - thanks! I had read and agreed with much of what I had read in other books the author surveys - Senior's "All Joy and No Fun" and the "Bringing up Bebe" about the contrast between French and American parenting - so I was predisposed to agree with this author's viewpoint. However, given the context of her experience, one can only hope that she won't be preaching to the choir but will effect I received an advanced reader's copy of this book through Goodreads Giveaways - thanks! I had read and agreed with much of what I had read in other books the author surveys - Senior's "All Joy and No Fun" and the "Bringing up Bebe" about the contrast between French and American parenting - so I was predisposed to agree with this author's viewpoint. However, given the context of her experience, one can only hope that she won't be preaching to the choir but will effectively reach a wider audience. I probably should not write a review because I had the patience to read only seven chapters of this book. As someone has mentioned earlier, it would have made a great article, but the book was too long-winded and repetitive. I don't think I am the right audience for this book either. I was going to listen to the author speak in our local theatre but now my ticket is up for grabs. It was my first how-to book. Maybe I am just not used to the format. A friend of mine and I use the term "benign neglect" to characterize our own childhoods. It isn't a term we coined and it isn't always a negative critique, but it aptly describes the upbringing we got. Did we not know that we probably had it pretty good? We were that last generation of kids that were allowed more freedom and self-building autonomy than our children get today. I suspect that many of GenX kids didn't know that when they became parents themselves, the pendulum would swing boldly in reaction and in critique to our own childhoods. Today's kids are over-scheduled and stressed. "Helicopter" parents hover close by ready to swoop in and to take control often micro-managing the details of their children's lives. What forces are at play in modern parenting? The sobering detail entails that so much of our parenting is aimed at giving our children a comfortable pain free environment in which to thrive. On the surface, there is nothing wrong with this sentiment. We love our children fiercely, but often our own egos intertwine in our children's successes. Their success, in turn, becomes our success. The hovering parent often see their kids as extensions of themselves blurring the lines making their child indistinguishable as a separate entity at all. The urge to over-parent often comes with pressure that a good parent is highly involved in the minutiae of their kids lives. Novels like Liane Moriarty's Big Little Lies and The Admissions by Meg Mitchell Moore satire the pressures of modern parenting catching the zeitgeist of our times. What do we do to turn the ship around? How to Raise an Adult makes the case that parents need to back off, foster independence, and self-efficacy in our children. We are doing them a huge disservice as we act as bumpers to the real discomfort and disappointments that accompany real life. Lythcott-Haims focuses intensely on the insane college admissions frenzy that often begins early while children are still in elementary school and sadly, even earlier. Parents think entirely in terms of transcripts and applications and thus, they end up "manufacturing" their children to fit into the narrow college board definition of what admissions deem acceptable. College admission, and more specifically name brand elite college admission, is short-changing our children. They are losing their childhood to over-scheduling extra-curricular activities that look good on college applications. Play is the domain of children where they can problem solve on their own by using and developing their imaginations. Modern parenting often looks at play as something suspect. We ask ourselves how can they be using their time better or is play a waste of time? We don't want to see our children look good on paper, but in real life, lack character and grit in the real world. So, Lythcott-Haims suggests that we ask our kids to do more for themselves. Doesn't that sound simple? Of course we want to raise kids that can figure things out on their own, but the helicopter parent is quick to fix things when it gets too tough for our kids. That toughness is exactly what they need to thrive. What I really liked about this book is that she touches on many other issues facing our kids and references many other books that I've read that really add to the discussion and expand on the notion of what to do with today's over-parenting and the effect it's having on this generation of kids. For instance, this generation of kids is the most supervised of any other generation taking considerations for safety to astonishing new levels. We've forgotten how to let our children to just be without the urge to continually mold them towards college success. This book reminded me that our kids need real world skills along with all those AP classes their taking. They will feel more proud if they can feel that they can do things for themselves. This book also reminded me of another book that addresses the college frenzy: Where You Go Is Not Who You'll Be: An Antidote to College Admissions Mania by Frank Bruni. So, what can we do to turn the tide on the epidemic of over-parenting? We need to see childhood as the time to nurture independence. We need to encourage our kids to do for themselves. We need to encourage them to work and not just at their school work. We need to calm down about college and most importantly, we need to get our own lives and nurture our own selves!